New position announced at an Association of Atlantic Universities’ conference on mental health held at Mount Allison University. 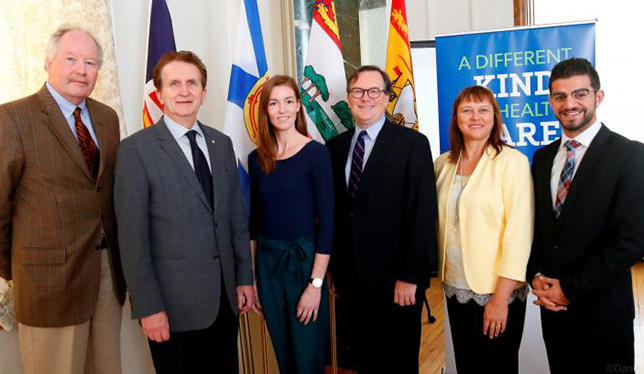 Universities in Atlantic Canada are taking a regional approach to address the urgent need for improved mental health services on its campuses. The Association of Atlantic Universities, representing 16 universities, has appointed Elizabeth Cawley as the full-time regional coordinator to support student mental health initiatives. The new position was announced at an Atlantic Canadian Conference on Student Mental Health held at Mount Allison University on October 4. Dr. Cawley brings a personal perspective to the role, having suffered from mental health issues throughout her high school and university years. Diagnosed with ADHD and anxiety in Grade 10, she said she understands the stigma attached to individuals suffering from mental illness and the struggles students face to achieve academically. Dr. Cawley said her personal experiences have fueled her passion for the topic and made her a better student advocate by giving her a clearer understanding of the issues facing students and the sense of urgency in finding solutions. Prior to her new appointment, she was completing her PhD in psychiatry at McGill University and doing mental health strategy consulting with other universities. (Left to Right): Peter Halpin, executive director of AAU; Robert Campbell, president of Mount Allison University; Elizabeth Cawley, AAU regional mental health coordinator; Erik Sande, president of Medavie Health Services; Anne Comfort, director of Accessibility and Student Wellness, Mount Allison University; and Ossama Nasrallah, president & CEO of Saint Mary’s University Students’ Association. A 2015 study that polled first year incoming students showed that 87 percent of students place more emphasis on being academically prepared than emotionally ready for university, she said. “Emotionally unprepared students feel stressed, overwhelmed and lacking personal resources, which often leads to unhealthy coping like alcohol and drug use,” said Dr. Cawley. She feels a student’s overall experience depends on how well-prepared they are to cope and adapt to new situations, which is vital to maintaining balance. Students face a lot of “firsts” away from home and often lack the life skills and resiliency they need to effectively deal with such new stresses in their life. “Resiliency is critical to moving from survive to thrive,” she said. The needs of university and college students are different in Atlantic Canada, she continued. There’s a lot of variation within in the region, with some very large institutions and some very small, so it’s not a one-size-fits-all situation. Regardless of size and location, she said students should have access to care when they need it. A large three-year research study will be conducted at all 16 Atlantic Canadian universities to determine student needs, what barriers they face in accessing care, their level of resilience and how services can be better offered. Currently with Memorial University’s Research Ethics Board waiting for approval, the study will help provide a better picture of what’s going on not only in the region as a whole but at each individual institution. “We need to consider the needs of Atlantic students differently and not just depend on studies from larger centres,” she said. Indigenous students also have unique needs as do international students, who currently represent the largest growing enrollment at Canadian universities, with students from 150 different countries coming to Canada each year to study. “We know there are issues but we need more research to understand what their needs are and how we can provide services to that growing population so they get the help that they need,” she said. She sees innovation and technology as one way of decreasing the number of students with unmet needs. Online programs like TAO (Therapist Assisted Online), a high-intensity treatment model that combines online treatment with weekly therapy sessions, are needed to facilitate better access to care because the number of counselors isn’t sufficient at the moment. “We know there is technology that can facilitate better care,” she said. Dr. Cawley said she considers Peter Cornish’s Stepped Care Model out of Memorial University as an important resource and an innovative step forward. With this model, the level of intensity of care is matched to the complexity of the condition as not everyone needs to see a therapist all of the time. Dr. Cawley’s position is supported in partnership with the non-profit company Medavie Health Foundation.